NYMAN, Donald James - Age 87, of Davison, died Thursday November 22, 2018. A memorial service will be held 2PM Thursday, November 29 at the Davison V.F.W. Post 4087, 8031 E. Court St., Davison (corner of Irish and Court Streets). Arrangements provided by Sharp Funeral Home and Cremation Center, 6063 Fenton Road, Flint. Those desiring may make contributions to the Davison V.F.W. Post 4087. Donald was born August 18, 1931 in Detroit the son of the late Theodore and Cecil (Chapman) Nyman. He married Yvonne Sliger on October 23, 1954 in Flint, she preceded him in death on February 6, 2010. Donald proudly served his country in the United States Marine Corps during the Korean War. He worked for GM Buick with 39 years of service as a construction welder before retiring in 1988. 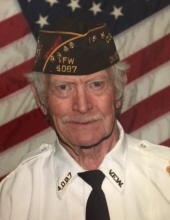 Donald enjoyed hunting, fishing, camping and was an active member of the Davison V.F.W. Post 4087 color guard. He is survived by his daughters: Robin (Brian) Berkey of Flint, Tamara (Jim) Gates of Davison, Kimberly Spillers of Davison; 6 grandchildren, Jarrod and Shannon Berkey, Nicholas Ireland, Amy (Corzell) Spillers, Melissa Spillers; 10 great-grandchildren; brother, Gordon (Gloria) Nyman; sister-in-law: Mona Kay Sliger. Donald was preceded in death by his parents; wife: Yvonne; son-in-law: Rod Spillers; grandson, Anthony James Ireland; brother, Albert Nyman; brother-in-law, Leo C. Sliger; sisters-in-law, Loretta Nyman and Ruth Nyman. Tributes may be shared at www.sharpfuneralhomes.com. To send flowers or a remembrance gift to the family of Donald James Nyman, please visit our Tribute Store. "Email Address" would like to share the life celebration of Donald James Nyman. Click on the "link" to go to share a favorite memory or leave a condolence message for the family.